Scotland. 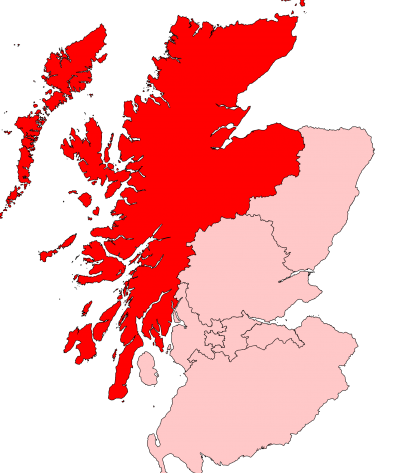 The Highlands and Islands are in red. The Gaels are the people who speak Gaelic, understand and take part in Gaelic culture. Most Nova Scotia Gaels can trace their families back to people that came from the Highlands and Islands of Scotland to Nova Scotia between the years 1773 and 1850. They tended to settle together with other family members and neighbours from "The Old Country" so that they could share similar traditions and be surrounded by people they knew. Traditionally Gaelic-speaking areas in Atlantic Canada. Red shows the areas containing the most speakers. The Gaels of Nova Scotia speak Scottish Gaelic, is a Celtic Language that has its origins in Ireland but was and continues to be spoken in parts of Scotland and Nova Scotia. Many languages come from a common root, but like a tree, they branch out and change through time. The closer they are to each other in this tree, the more alike they are; the further away they are from each other, the more different they are. Languages are grouped into "families" that are all in some way alike. As you can see below, Gaelic belongs to the Celtic Language family and shares a lot in common with Manx and Irish Gaelic. French belongs to the another language family and has a lot in common with Italian and Spanish. Many people who speak Scottish Gaelic say that they can understand some Irish Gaelic but the sounds in the two languages and some of the words are different. The Gaelic that we speak in Nova Scotia is the same that you would hear in Scotland today but maybe our accent is a little different. To most English speakers the word 'clan' has come to mean members of the same family, such as the Campbells or the MacDonalds. The word 'clan' comes from the Gaelic 'clann' which means children. Gaels swore loyalty to a clan chief in exchange for land to live on and protection in times of war. Not all people in the clan were family though, that's the great thing about kinship! They often took the last name to show support for their leaders. Most people who moved to the island of Barra were forced to take the last name of the local chief, MacNeil. That's why there are so many MacNeils in Barra and why the MacNeil name is common amongst their descendants in Nova Scotia. Many, but not all, Gaelic last names begin with a 'Mac' or sometimes 'Mc'. This means 'son of'. Last names were not used a long time ago, so most people just gave their first name and the name of their father. The first of the MacDonalds was Aonghus mac Dhòmhnuill (Angus son of Donald). Why did the Gaels come to Nova Scotia? Most Gaels in Scotland did not own their own land, but instead rented land from a landlord. Many who could not afford to pay rent worked for the landlord as servants. In Nova Scotia, Gaels would not have to pay rent for the lands they lived and worked on. In some cases, land was given to them for free (if they agreed to cut down some of the forest and keep a farm). In other cases, people were given a certain amount of time to raise the money to purchase the land from the government. Land was very important to the Gaels. Very few of them could own their own land in Scotland. The Gaels found it difficult to raise enough crops to feed themselves, let alone cover the cost of rent. In certain cases, some Gaels were forcibly removed from their lands by landowners who thought they could make more money from sheep farming than rents collected from their tenants. This process of removing people from their lands in the Highlands and Islands is known as the Clearances. Almost all the tenants from Strathglass were removed from their land in 1801 and replaced with sheep. 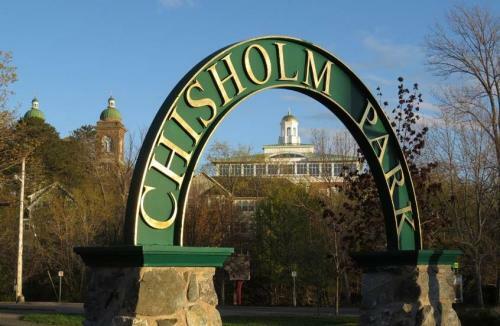 Many of these people were Chisholms who settled in Antigonish County. 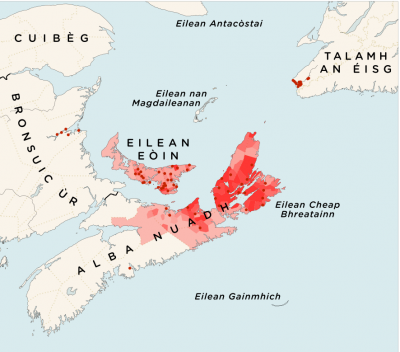 Why are the so few Gaelic speakers left in Nova Scotia? This is a very complicated issue. Even the government of Scotland tried for centuries to wipe out the Gaelic language in the Highlands and the Islands, in the hopes of having only one language and culture in the country. In Nova Scotia children were often punished for speaking Gaelic in school. In frustration, some children left and chose not to attend school. Gaelic began to be associated with a lack of schooling and poverty. When children that had been punished in school for speaking Gaelic grew up and became parents, many of them chose not to pass the language onto their children, not wanting them to be punished themselves and believing that Gaelic would not be of much use to them. Today, many children and grandchildren of Gaelic speakers are trying to learn the language. As of 2017, Gaelic is taught in 11 schools across Nova Scotia. 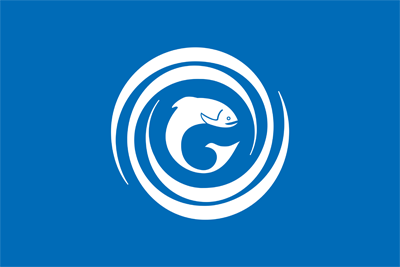 The flag of Gaelic Nova Scotia features a salmon in the shape of a "G". The image is that of a salmon in the shape of the letter 'G', standing for Gaelic. The salmon represents gift of knowledge that we receive from our storytelling traditions. 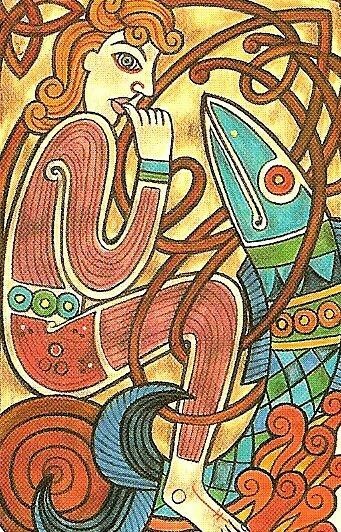 In Gaelic, this particular salmon is referred to as The Salmon of Knowledge, and it appears in the following story set in Ireland, over a thousand years ago. The story also involves Finn MacCool, who was the leader of the band of ancient warriors called the Fianna. Have you ever heard of a man called Finn MacCool? Well, there are many stories to be told about him, but one of the best is the story of the Salmon of Knowledge. When Finn was just a boy he had to leave his home and live with a wise man named Fineagas, who was to be his tutor. The old man Fineagas was not used to company as he’d been living by himself in a small cottage by the River Boyne for years and years, but he was happy to have Finn to stay. But what Finn didn’t know, to begin with, was that Fineagas had spent so many years living by himself in that cottage for one very special reason. The reason was that it was rumoured in those parts that a fish called ‘The Salmon of Knowledge’ swam in the nearby river. It was said that the first person to taste this salmon would receive the gift of seeing into the future and the gift of seeing into the past, and would certainly become the wisest in all of Ireland. So Fineagas had spent many years fishing in that river, hoping that one day he would come across the Salmon of Knowledge. One day, as Fineagas was giving Finn a Latin lesson by the river, Fineagas noticed an unusual stirring in the water. He took a closer look, only to see a huge, beautiful salmon of the most glorious pink colour swimming in their direction. ‘It must be the Salmon of Knowledge!’ cried Fineagas, and he quickly ran to fetch his net – and a big one at that, for the salmon really was huge. Another thing he had to be careful of was to avoid looking directly into the eyes of the fish or he would be put into a deep sleep, so as he struggled with the net he was very careful to avoid looking in its direction. All of a sudden, the salmon leapt out of the water right in front of him and Fineagas could do nothing to avoid looking straight into its eyes. With that, he immediately fell into a deep sleep. Finn saw all this happening, and so went to Fineagas and shook him awake. Once awake, Fineagas asked Finn to tie a rag from his shirt around his eyes so that he couldn’t see the salmon anymore. Finn obeyed, and a blind-folded Fineagas and a tenacious salmon quarrelled and fought for the rest of that afternoon until the fish eventually gave up the struggle. Fineagas had caught the Salmon of Knowledge. He would be the wisest person in all of Ireland. Now he had successfully caught the salmon, Fineagas was exhausted. He went off to have a snooze and asked Finn to cook the salmon. He made Finn promise not to take even the smallest bite of it. So Finn took the great big salmon, and cooked it on a spit above a peat fire. After a good while turning the spit (and getting very hot from the fire) Finn thought the salmon looked perfectly cooked, and so he called Fineagas over to taste the fish. But just as he was turning around, a small drop of burning fish oil splashed up onto his thumb. Quick as a flash Finn stuck his thumb in his mouth to stop it burning. When Fineagas awoke and came over to check on Finn and the salmon, he immediately noticed a great change in Finn MacCool. There was a light behind his eyes that had never been there before, like that of a flame, and his cheeks were glowing bright. "Finn, did you eat any of that salmon?" demanded Fineagas. "I didn’t eat any, no!" said Finn. "Did you taste any of it at all?" asked Fineagas. Finn thought back, and then remembered about putting his thumb in his mouth when he had been burnt by the hot fish oil. He told Fineagas about this. Fineagas understood there and then that the special knowledge which came only from that cooked salmon on the spit had been granted to Finn and not him. Despite his loss, Fineagas was happy for the lad, since he knew that he would grow up to be a most wise man and a great hero. From that day forth, Finn MacCool would be the ablest and most celebrated leader of the Fianna warriors.